How the ABMI successfully reaches all four corners of Alberta’s wilderness to collect biodiversity data. Before dawn, the early spring morning is tranquil. Mike Boucher, ABMI terrestrial field coordinator, carefully manipulates his truck down a narrow and winding logging road, which is still illuminated by the nearly full moon. Having left his temporary field base in Peace River at just 2:30 am, Mike is starting off his work day with the best case scenario in mind: the roads have recently been graded and there is no forecast of rain. 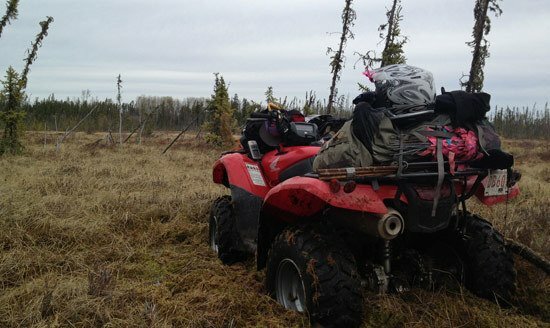 Under these circumstances, there’s a good chance he and his crew will both reach their planned survey site in Alberta’s boreal and collect the data necessary to complete their biodiversity survey. Although Mike spent the majority of the previous night going over maps and potential access routes with the two new field technicians he supervises, there’s no guarantee things will go as planned. As he travels closer to his destination, Argo in tow and equipment in cab, he reminds himself that they rarely do. From the boreal forest in the north to the grasslands in the south, the ABMI monitors the state of Alberta’s biodiversity. To do this, the ABMI employs a systematic grid of 1656 site locations across the province—spaced 20 km apart—to collect biodiversity information on terrestrial (land) and aquatic (wetland) sites. Determining how to reach any particular ABMI survey site is no quick task; planning begins well in advance of a field season that kicks off in May of each year. During the winter months, field coordinators and full time technicians spend countless hours looking at satellite imagery on Geographic Information System (GIS) to designate each site as either “remote”, “ground access by ATV or Argo”, or “ground access by truck and foot”. “We use a range of GIS information that show where paved or gravel roads, seismic lines, and pipelines are throughout the province to determine if it’s realistic for us to reach the site by ground or not,” says Jesse Watkins, an aquatic field coordinator who will be based out of Grande Prairie this summer. In addition, the distance to sites can be too long for technicians to feasibly reach the site and complete their survey in one day. “If we think there is a possibility, we will try. If not, the site becomes ‘remote’ and is reached by helicopter, which is significantly more expensive,” explains Watkins. As Mike and his field crew unload the Argo from its trailer and fill it with the day’s field equipment, he recalls how wet the land looked in the satellite imagery and anticipates a slow, messy ride to their site. 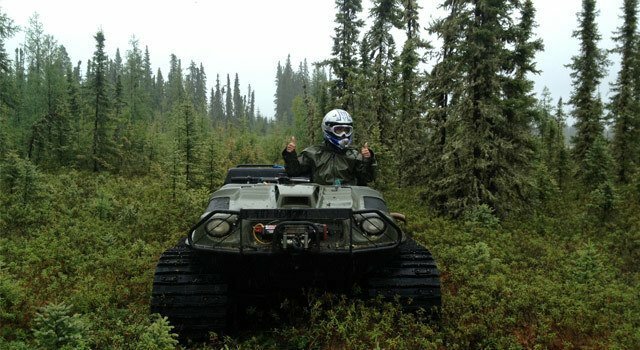 He’s spent many mornings in the boreal slowly traversing the landscape, at times carefully winching his ATV from tree to tree through wet patches and at others, retracing his steps to attempt yet another route to reach his destination. He refocuses on the day ahead, and once ready, he and his team depart down the newly cleared seismic line and begin the second leg of their journey to the site. Even if field staff believe the site is reachable by ground, this won’t necessarily be true. Seismic lines can be too wet or overgrown, trails or secondary roads may not exist, and those roads that do exist may be in horrible condition. “This is where we encounter the majority of our access issues,” says Watkins. 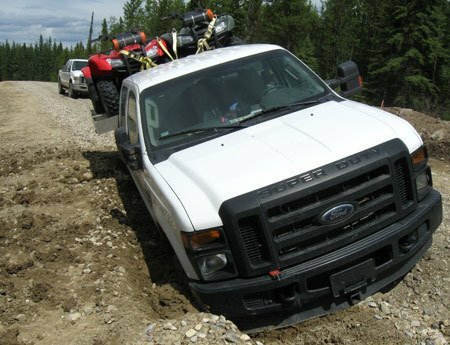 “Trucks can get stuck in heavy clay areas (especially when wet); ATV’s can get stuck in muskeg; and, sometimes we come across barriers we didn’t know existed such as stream crossings or wetlands.” Field crews will attempt to free their vehicles and continue access if successful. If not, the site may be designated as remote, or crews may attempt a visit on a day when road conditions are more favourable. Although ‘remote’ sites are only located in the boreal, where road infrastructure often simply doesn’t exist, technicians still face significant access challenges—albeit different ones—across the province. To begin, the ABMI has two year-round staff members who work to ensure, through phone calls and face-to-face visits, that ABMI field technicians have permission from private landowners and leaseholders to access their land and conduct biodiversity surveys. Furthermore, reaching a site in the grassland or parkland regions can still involve physical and mental resolve. It’s fairly common to hear stories of a long drive down a poorly maintained range road that leads to crawling under multiple barbed-wire fences and a hike across two quarter sections of land—all with heavy packs in tow—before the field work even begins. A lot like basic training for the army! Although the ABMI makes every effort to reach each planned survey site every field season (our data collection and analysis depends on it), staff safety is an absolute priority. New staff receive first aid training, instruction on the standard operating procedures for all equipment with potential hazards, and additional safety training (if applicable) to operate 4×4 trucks and ATV’s. Once in the field, all field crews have designated daily check-in times and are guided by the principle to err on the side of caution. The ABMI has an exceptional safety record to date, and all current safety protocols indicate this will not change. A dull drone follows the Argo and its passengers down a thin cutline. As Mike keeps the machine on course, a field crew member uses her GPS to navigate their discussed route and she gestures that their site is near. With a quick rush of relief, Mike slowly brings the Argo to a stop and is thankful they have completed the access portion of their day without any problems—now the real work begins.